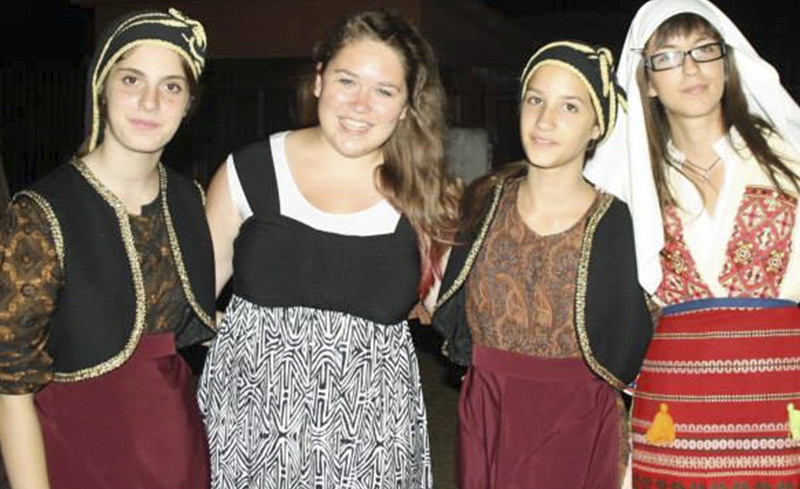 As a YFU summer student in Greece, you will undoubtedly experience philoksenia wherever you go and whatever you do! Philoksenia is a combination of philo — to love — and xenos — stranger or guest. 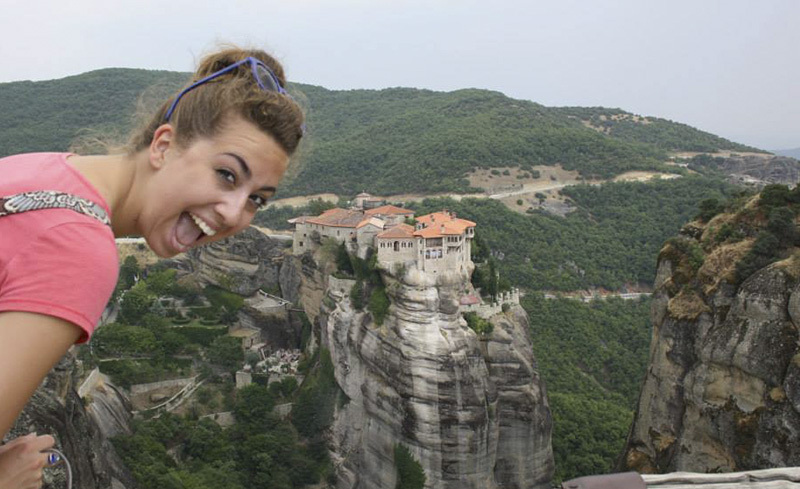 As a YFU summer student in Greece, you will undoubtedly experience philoksenia wherever you go and whatever you do! Philoksenia is a combination of philo — to love — and xenos — stranger or guest. As a YFU summer student in Greece, you will undoubtedly experience philoksenia wherever you go, whatever you do, and especially within your host family. It's not uncommon for Greek households to include grandparents, aunts, uncles, and cousins. Greeks traditionally express their emotions freely so you should get ready for generous Greek hospitality. Expect to eat well while you are in Greece, but at different times than you are used to eating: lunch is the main meal and there is a light dinner in the late evening. An important feature of Greek culture for the first-time visitor is the Mediterranean attitude toward time. Greeks generally think in the present and tend not to organize their days to the hour. One of the most vivid examples of Greek culture is Greek religious holidays. Since 97 percent of the population belongs to the Greek Orthodox Church, it's likely that you will get to see one of the festivals marking a patron saint's day. Considered the cradle of democracy, Greek history unwinds from the most ancient of times to the present day in a colorful scroll. While city-states began developing about 1000 B.C., ancient Greek civilization reached the highest point of its glory in 400 B.C. Western civilization owes much of its knowledge about justice, liberty, and law to the ancient Greeks; Greece also gave the world a vibrant heritage in the arts, science, and philosophy. Water sports, days at the beach, discos, and movies. Meals, drinks and snacks are included in most of the YFU programming. Students should bring an International Student ID card to receive free admission to most museums and monuments. Students are also advised to bring a small backpack for day trips and to pack lightly for the small flight to Santorini to avoid additional luggage fees. Program tuition does not include personal spending money. Imagine sun-drenched beaches, historic sites like the Parthenon and Acropolis, amazing Mediterranean food, and a family of hospitable and friendly Greeks. Imagine enjoying all of this for three weeks during your YFU summer program. Not only will your YFU experience be lots of fun, you'll also learn about one of the oldest and most rich cultures in the world. An educational program filled with museum visits, walking tours, Greek lessons, and a science project, you will get a chance to soak up thousands of years of history while host family stays will introduce you to modern Greek culture as well. You'll also have plenty of time to enjoy the natural beauty of your surroundings, with boat trips, swimming, and time exploring picturesque Greek islands. YFU may accomidate younger travelers on this trip, however, high school students still are encouraged to apply. All students will live with host families in and around Volos and will participate in organized activities and day trips as a group. Day 2: Arrival in Athens. Stay in a hotel in Athens. Day 3: Athens- Visit the ancient ruins of the Acropolis and the new Acropolis Archeological Museum. Day 4: Athens- Visit the National Archeological Museum. Travel to Volos and meet host families. Day 5: Volos- Orientation Day in Volos. Visit Makrinitsa, a village on Mount Pilion. Day 6: Walking tour of Volos. Visit the Volos Archeological Museum. Day 7: Free time with host families. Day 8: Free time with host families. Go swimming with your host siblings and new friends. Day 9: Free time with host families. Day 10: Take a mini cruise in the Aegean Sea during a trip to the island of Skiathos. Day 11: Lecture on the UNESCO World Heritage site Meteora and the 16th century Eastern Orthodox monastaries. Day 12: Visit to the Meteora monastaries and to the Natural History museum. Day 13: Greek language lesson. Bake cookies together. Day 14: Participate in a science project and learn about aquaponics at the University of Volos. Day 15: Olive oil tasting at a local factory. Day 16: Free time with host families. Day 17: Greek language lesson. Day 18: Farewell party by the sea. Day 19: Departure from Volos by mini bus to Santorini. Day 20: Santorini- Take a plane or ferry to the island. Day trip around the island, visit a local museum with ruins of an ancient village destroyed by an earthquake and volcanic eruption. Day 21: Santorini- Boat trip around the island. Day 22: Departure for home from Athens. Students should be between 13 and 16 years old. 2019 Summer program: August 4, 2002 - July 14, 2006. Students who do not meet this age requirement will be considered for admission on a case-by-case basis. Greek. Previous language study is not required. The program includes 4 hours of Greek language training. All host families live in and around Volos, a coastal city about 4 hours north of Athens. This program can be offered as a YFU Classroom Excursion group trip for your students. Please contact YFU as soon as possible if you are interested in becoming a chaperone or any customizations for your group. To learn more about YFU Classroom Excursions, please see our catalog and fill out an interest form here for information and next steps. This unique YFU program is especially geared towards younger travelers and middle school and early high school students are encouraged to apply. All students will live with host families in and around Volos and will participate in organized activities and day trips as a group.